The collapse of the US–North Korean denuclearization negotiations in Hanoi earlier this month and the prospect of a return to President Trump’s hard-line rhetoric of 2017 have intensified public interest in what life is really like inside the Democratic People’s Republic of Korea, a country known as one of the most repressive on earth. So it’s no surprise that dozens of Washingtonians have come to see John Feffer’s new play, Next Stop: North Korea. It’s the latest in a series of one-person dramas the author, novelist, and sometime Nation contributor has written and performed in over the past eight years. As entertainment that deftly mixes history, satire, pathos, comedy, and personal recollection, Next Stop is an unqualified success. In the two performances I saw at the DC Arts Center in Washington’s Adams Morgan neighborhood, the audience seemed spellbound as Feffer led them on a virtual tour into this now-forbidden land where few Americans outside the government have ever ventured. Both shows included solid performances from Feffer, who made three weeklong trips to the DPRK between 1998 and 2001 and wrote a book about North and South Korea in 2003. He explains the country through his own experiences in Pyongyang as a dual representative, with his wife Karin Lee, of the American Friends Service Committee (AFSC), and in the projected voices of several finely etched Korean characters. They include “Mr. Kim,” his ubiquitous minder, who “looks like an ambitious stockbroker” and loves pastrami sandwiches and sappy American tunes (“You Are My Sunshine” and Joni Mitchell’s “Clouds”) from his time serving as a diplomat in North Korea’s UN Mission in New York. There’s also the tour guide at the Tower of the Juche Idea in Pyongyang, who deeply admires—and hilariously imitates­—Kate Winslet’s assertive voice in Titanic, which she’s seen 500 times; a group of South Korean devotees of the Rev. Sun Myung Moon, who inexplicably are building Pyongyang’s largest church and apparently own the hotel where Feffer and Lee are staying; a German entrepreneur trying to sell investors on North Korea because in the DPRK they can have “the best Korean workers without the strikes” that regularly occur in South Korea; and a US-based North Korean defector wearing a baseball cap who escaped from his country in 1999 as a child at the peak of the terrible famine that killed nearly a million people. As the house lights dim, Feffer’s faux Scottish “guide” gruffly explains (in full brogue) the strict rules to his flock at the airport in Beijing before they fly off on their imaginary visit to North Korea. “This is not a trip to Disneyland,” he instructs. “Rule Number One: Follow orders. Rule Number Two: Follow orders. And Rule Number Three: Follow the bloody orders.” He adds: “Do not take anything, especially propaganda posters.” When that draws nervous laughter, he snaps, “Otto Warmbier didn’t think that was funny”—a reference to the American student who was arrested by North Korean authorities for taking a propaganda poster and returned a year and a half later, in a coma from which he would never recover. Later, Feffer jokes about the strange friendship between Donald Trump and Kim Jong-un. (“They were having such a love affair I thought it might have been consummated,” he says, adding that the failed meeting in Hanoi was a “summit interruptus.”) But as Feffer gets deeper into his narrative from Pyongyang, the picture he presents from his own journey in the 1990s turns dark and even terrifying. While in Pyongyang, Feffer is most struck by the corruption at the top and the vast political control the leadership exerts. To his consternation, North Korean bureaucrats stage huge banquets for foreign guests at a time of widespread hunger and starvation (that period is long past, but the country still experiences malnutrition). Society is strictly controlled: “Mr. Kim” explains that, decades after North Korea’s founding, its population is divided into three classes: “core” supporters of the regime (like him), who are allowed to travel overseas; citizens who are “wavering” in their loyalty to the Kim family and the North Korean state; and “hostiles,” who are ostracized because their families collaborated with the Japanese colonialists who ruled Korea from 1910 to 1945 or fought against the revolution after the Japanese were kicked out at the end of World War II. Meanwhile, Feffer relates, the North’s dynastic government is so obsessed with the United States that it portrays, at one of its Korean War museums, a well-documented incineration of hundreds of women and children in an underground bunker in October 1950 as the work of sadistic Americans, when it was actually South Korean forces who did the deed (“It’s much easier to blame everything on you Americans,” the European diplomat who reveals this fact tells him during one of those interminable banquets). The reason, he later learns: After unification, North Koreans would not want to come face to face with South Koreans who did such despicable things. Feffer also describes his own experience with North Korea’s elaborate police state. In one episode, he recalls how he and his wife sneaked out of their Pyongyang hotel one night and walked nearly a mile before they began to speak in furtive tones about their feelings about the place. As they whisper, his wife wonders how an erudite and worldly man like Mr. Kim can engage in such “mumbo jumbo.” The next morning, their minder picks them up for a meeting at the ministry of health, where they hope to pitch the government on an exchange of medical professionals; he coolly tells his AFSC guests to pay attention, because “we do not want to hear any mumbo jumbo.” Feffer and Lee freeze: They’ve never heard this term from Mr. Kim before. “He is telling us to never forget where and who you are,” Feffer explains with a shudder. Feffer’s impatience is a constant from the beginning. In the play’s first scene in Pyongyang, he refuses to bow properly, as his minder desperately urges, before the massive statue to Kim Il-sung, North Korea’s founder. Instead, persuaded by his wife that he “has to bow” because he’s “representing the organization,” he screams silently to himself as he bends his neck ever so slightly and mutters, “you’re a murderous dictator.” That jarred me a bit because I had heard that exact phrase stated on television during the Hanoi summit from MSNBC’s Mika Brzezinski as she sought to paint as negative a picture as possible of Trump’s meeting with Kim. Feffer also argues against the notion that the Kim government deliberately starves its people (a meme I also heard from Brzezinski during her shrill denunciation of the summit on MSNBC). Partly because of the collapse of the Soviet Union in 1991, North Korea lost its cheap supply of oil. Since then, as a result, “their farm machinery lacks fuel, so the work must be done by hand,” Feffer says of the situation in 1998. That’s still one of the reasons that humanitarian workers who are experienced in North Korea say some of today’s UN sanctions on oil imports should end. (“Absent sanctions exemptions that would allow for necessary oil-based inputs into the 2019 agricultural production cycle, the logical corollary is an expanded food catastrophe, threatening lives and livelihoods of millions of North Koreans in 2020,” Hazel Smith, a British expert on the North Korean economy, wrote this month in a US policy journal). Most important, Feffer is able to find the humanity in the people he encountered while trying, as a representative of an organization dedicated to peace, to “bring the US and North Korea closer together.” At an otherwise strained meeting with officials from the Institute of Architecture, he finds common ground with “Mr. Cho,” a high-ranking official who, like Feffer, speaks Russian from his student days in the Soviet Union. While the rest of the room looks on, they embark on a spirited discussion in their common language about sustainable, energy-efficient architecture (something Feffer is somewhat of an expert on). “Mr. Cho really cares about building things to help people,” he finds. But then Mr. Cho switches back to Korean, and the moment of unity disappears as the idea for an architectural exchange is vetoed from above. Feffer also acts out the part of his laid-back driver, who, upon seeing glossy ads in a South Korean magazine while idling at a collective farm, dreams of owning a fancy automobile and taking it out whenever he pleases. “It may sound simple and banal,” Feffer says, “but North Koreans are not simply automatons. They are people trying to survive the best they can under very difficult circumstances.” He recalls an ancient Christian fable he heard from his Moonie contact in Pyongyang about the difference between heaven and hell, where the only utensil available is a super-long spoon; in heaven, people feed each other, but in hell, nobody shares, and everyone starves. During parts of his trip, “I see how quickly hell can become heaven,” he says, ruefully. “I just have to turn one spoon of mine and feed someone other than myself.” It’s an argument against withholding food aid and other assistance to the DPRK. 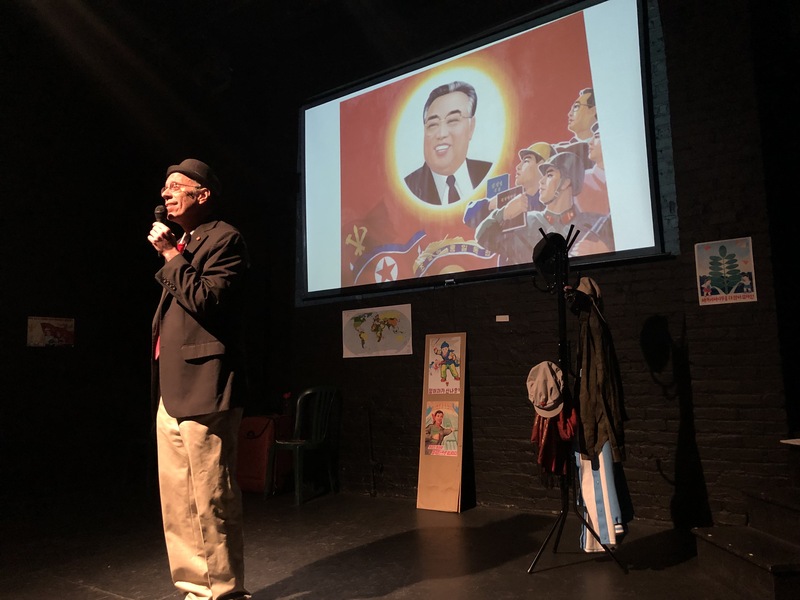 Maybe that’s why, in an effort to further humanize North Korea, after every show Feffer brings on a guest knowledgeable about the country to provide a short commentary on the play and answer questions from the audience. They have included Jenny Town, a sharp North Korea expert at 38 North, a website devoted to North Korea run by the Stimson Center; Jean Lee, a former AP reporter in Pyongyang; and Daniel Jasper, AFSC’s public education and advocacy coordinator for Asia. The first night I went, Feffer’s guest was Immanuel Kim, an associate professor of Korean literature and culture studies at George Washington University and the author of Rewriting Revolution: Women, Sexuality, and Memory in North Korean Fiction. Immanuel Kim argues against a common misconception: that all art in North Korea is dedicated to praising the Supreme Leader, as Kim Jong-un is known. Not so, he says, from his reading of hundreds of works of North Korean fiction. Much of its literature, and television drama as well, is about “family problems,” neighborhood dynamics, and the complications in relationships between men and women. At one Saturday matinee, the guest was Ryan Oh, a young North Korean defector from one of the country’s northern provinces now living in Washington on a short-term US visa. He speaks of his dangerous escape with his mother to China in 1999, during the famine, and how he was caught and returned to North Korean security forces in 2000. After being released (his captors understood that he left because he was hungry, he told me), Oh then managed to escape again in 2002, made his way to Canada and eventually South Korea, where he now lives with his mother and brother. The entire experience of Next Stop: North Korea, from play to Q&A, is both enlightening and depressing, if not discouraging. My only criticism, as someone who’s written extensively about the Koreas, is that it lacks context in some places and, oddly, empathy in others. I especially felt that toward the end, in a scene that takes places in Gwangju, South Korea. That was the site of a horrific massacre in 1980 of hundreds of people by South Korean Special Forces and, subsequently, a citizens’ uprising that was suppressed with the support of the US government and the Pentagon. Feffer and his wife are there on a tour of Korean War sites where US and South Korean soldiers committed atrocities against civilians. He is troubled by his hosts’ decision not to include North Korean atrocities on the tour, and abruptly leaves it to visit Gwangju’s famous Biennale art exhibition to work out his frustration. I found that off-putting; in that moment, Feffer seemed a little too focused on his own perspective as an outsider and an American. After leaving his group in Gwangju, he tells the audience, he “prefers to be with the ones who roams freely,” and adds, to laughter, “I’d rather be on a stage by myself.” I got that. But it might have helped the audience to explain—perhaps in a South Korean voice—that the activists focusing on US and South Korean war crimes may have been trying to overcome decades of anti-communist propaganda claiming that the DPRK was the only villain in Korea’s division and during the counterinsurgency wars that raged on the peninsula from the late 1940s through the Korean War. At the same time, Feffer missed an opportunity in this scene to remind audiences that South Korea, too, has experienced the terror of “murderous dictators.” In fact, their history in surviving authoritarian, repressive governments is something that leads many South Koreans to believe that their kin in the DPRK may someday overcome, just as they did in 1987, when mass resistance ushered in South Korea’s flowering of democracy. Feffer has changed them, too. In the end, his play, and the shifting perspectives of his characters, is a marvelous vehicle to help Americans understand what makes North Korea tick and why making peace is going to take years, even decades—and yet is the right thing to do. If you go, walk in with an open mind, take it all in, and ask plenty of questions. More than most commentators, Feffer knows that the key to ending the decades of enmity between North Korea and America is true engagement—with Korea, with ourselves, and with our own history. Next Stop: North Korea, written and performed by John Feffer and directed by Angela Kay Pirko, runs at the DC Arts Center until March 24.